India US defence deals have seen significant growth in the last two decades. India is expected to spend around $150 Billion on mega defence deals in the next five years . Both the US and Russia are now competing for the lucrative Indian arms market. India US defence deals have already crossed $15 Billion in the year 2015. Both India and the US have identified India US defence relations as the most important element of the strategic partnership between the two countries. India and US are natural partners and the convergence of interests have brought both countries together. The two countries share a broad consensus on a range of political, economic, and security issues important for both the countries. The defence relations between the two countries has now become one of the most important areas of cooperation and the top priority for both the governments. After India’s independence in the year 1947 , India had to face major armed conflicts , first with Pakistan and then with China. The US supported Pakistan during the 1971 India-Pakistan war due to Pakistan’s role and support against Soviet forces in Afghanistan . During the cold war period , India was mainly dependent upon the erstwhile Soviet Union for its defence equipment needs . During this period , the US was unwilling to supply arms to India due to India’s proximity to the Soviet Union and the differences in various policy issues prevailed between the two countries. However , after the end of the cold war and the collapse of the Soviet Union, India US relations significantly improved and the US was now willing to supply weapons to India . The warmth in the India US relations and the initiative by President Bill Clinton facilitated the defence cooperation between the two countries. For the first time , US had agreed to supply GE 404 engines for India’s indigenous fighter plane program LCA Tejas. US had also supplied India’s first supercomputer which indicated a major shift in US policies towards India. The India US defence relations have witnessed a major boost and India has recently signed agreements worth $15 Billion in the year 2015 for the purchase of various defence platforms needed for the modernization its armed forces. India is currently modernizing its armed forces and ranks amongst the largest importer of arms in the world . After the collapse of the Soviet Union , India continued its close defence ties with Russia and Russia still continues to be the largest exporter of arms to India . However , Russian weapons are no longer available to India at subsidized rates offered during cold war period . Barring few weapon systems ( Example S-400 ) in terms of technology , most Russian weapons are not comparable with the western systems. The Russian economy has also gone through a tough time due to a rapid decline in oil prices and the effect of sanctions imposed on Russia by the US and European countries . The collapse of the Soviet Union has also severally disrupted the supply chain for spare parts and other vital components for Russian arms . Non-availability of spare parts has now become a chronic problem for a large number of weapon system being used by the Indian armed forces. The Russian arms currently being manufactured in India are only being assembled from the kits imported from Russia . Russia is reluctant to provide the transfer of technology for full-scale production in India . As a result , India is still dependent on Russia for the supply of crucial spare parts and the maintenance of these equipment purchased from Russia . This is despite India being the largest market for Russian arms. Russia is now resorting to Indian arm twisting tactics by selling weapons to India’s arch-rival Pakistan . Russia has also developed close defence relations with China . Russia has recently sold top of the line Su-35 fighters and S-400 system to China which will be used against India . Needless to say , China will soon create a cheap pirated imitation copy of these Russian systems by reverse engineering . In the past , China has produced cheap imitation copies of most Russian defence systems imported from Russia . Why does India want to purchase US arms ? The warmth in the India US relations over the last two decades and the subsequent shift in the US policies favourable to India has developed a sense of mutual trust between the two countries . The US is no longer afraid of Russian influence in the Indian market and ready to accommodate India specific requirements. The US India defence cooperation initiated during US President Bill Clinton’s tenure has now developed into a full-fledged strategic partnership due to the convergence of interests important for both the countries . The Indian fear for unpredictable US behaviour and the possibility any future US sanctions have also gradually declined . The Trump administration has not invoked any sanctions against India so far despite the Indian purchase of Russian S-400 system and purchase of Iranian oil . US has also not objected to India’s recent successful tests of long-range nuclear-capable missile ( Agni 5 SSM ) tests which both China and Pakistan objected to. US India has already sealed two crucial foundational agreement necessary for the sale of high tech defence equipments to India . US companies are going all out to establish a firm grip on the lucrative Indian arms market . India has the fifth largest defence budget in the world and the Indian government will be spending close to $ 150 Billion on the modernization of Indian armed forces in the next five years. The “Make In India” is a flagship program for the Modi government and defence manufacturing is top on the agenda for the government . The Indian government has already sanctioned the total budget $63 Billion for the Financial year 2018-19. US companies always wanted to get entry into the lucrative Indian arms market. However , India US defence cooperation could not develop because of India’s insistence on local co-production in India and US reluctance during cold war period for such technology transfer. The Indian policies for mandatory co-production prevented the US companies from selling arms to India. However , the collapse of the Soviet Union cleared the major hurdles and US opened the doors for arms export to India and started developing defence ties with India . The Indian economy has also gone through major reforms and liberalization . India had opened many sectors for private sector investments especially in defence to attract the foreign direct investments in India . India is an important element of quad alliance shaping up amongst US , India , Japan and Australia . The recent Indian standoff with China over doklam ( In Bhutan ) clearly shows India’s resolve to take the China head-on . The defence cooperation between India and the US is important to get access to sophisticated US weapon systems in order to bridge the combat capability gap with China. India US partnership is extremely important for both countries. The Chinese imperialistic ambitions, expansionist policies and scant respect for international laws will create many conflicts in future . And therefore , The quad alliance is an important initiative necessary for regional security in the Indian Ocean . China’s aggressive posture in the South China Sea and the denial to accept the verdict given by international court has raised serious concerns about China’s intentions. The Chinese intimidating tactics and refusal for the right to navigate in South China sea international waters have created a potential flashpoint with the US. China is completely isolated on this issue with the rest of the world . The Chinese navy is aggressively expanding and also flexing its muscles in the Indian Ocean . The QUAD alliance has been formed amongst US, Japan, Australia and India to keep the Chinese expansionist policies under control . The Quad alliance was first proposed by Japanese Prime Minister Shinzo Abe in 2007. The QUAD is a group of the four like-minded democracies with common strategic objectives formed to enforce the rule of law and the regional security in the International waters. China’s open support for international terrorist Masood Azhar jeopardising its own credibility is a matter of serious concern . China is repeatedly blocking India’s attempts at the United Nations to add the Mumbai attack mastermind Masood Azhar as a global terrorist. Masood Azhar is chief of Pakistan-based terror group Jaish-e-Mohammed ( JeM ) responsible for carrying out many terrorist attacks in India . The US has always cited the absence of necessary framework as main reason for technology denial . The foundation agreement framework will enable the US companies to sell the latest weapon platforms and technology transfer for indigenous local production in India. Both the countries had started the discussion on these important agreements long back and the US managed to address the Indian concerns . Out of the three foundational agreements , India has already signed two agreements after prolonged negotiations with the US. The Logistics Exchange Memorandum of Agreement ( LEMOA ) was the first agreement out of three foundational agreements necessary to be signed between US and India . This agreement would facilitate the mutual exchange of logistics support, supplies and services ( LSSS ) between the armed forces of both countries operating in different parts of the world. 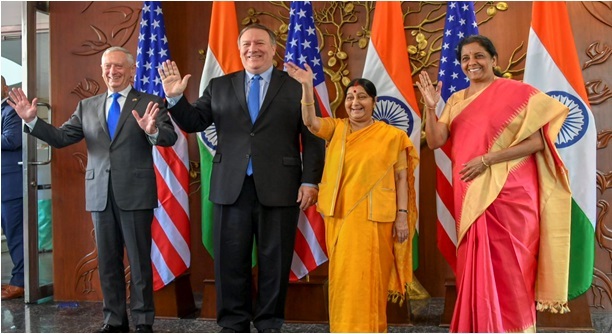 Both India and US managed conclude this agreement after prolonged negotiations lasted for almost for a decade and eventually signed the LEMOA in 2016 . The LEMOA agreement will allow both the countries to get access to designated military facilities on either side for logistics support such as refueling and replenishments during various operations . These operations include port calls, joint exercises, humanitarian assistance , training and disaster relief . The SOP ( Standard Operating Procedures ) are being worked out to facilitate its implementation . This act is originally referred to as the Communication and Information on Security Memorandum of Agreement ( CISMOA ). However , India had some serious reservations about certain provisions of this act . This act was later on modified to accommodate India specific concerns and changed to COMCASA to signify its India-specific alterations. India is now a signatory to this act and signed this act in recently concluded two plus two meeting between US and India . India has recently purchased a number of defence platforms from the US which include C-130 J, Heavy lift transport C-17 Globe master , Maritime Reconnaissance and Anti-Submarine P-8I aircraft, Ground Attack Combat Helicopter Apache and Heavy Lift Transport Chinook helicopters. The US weapon platforms sold to India prior to COMCASA agreement does not include some critical communication instruments installed in these platforms necessary for secured encrypted communication .The COMCASA agreement will now allow the US to install these high-end secured and encrypted communication equipments on the platforms being supplied to India. The third and the last one remaining foundational agreements that still needs to be signed is the Basic Exchange and Cooperation Agreement for Geo-spatial Cooperation ( BECA ). The BECA agreement intended for Geospatial Cooperation. This agreement would enable the mutual exchange of geospatial information between India and the United States for both civilian as well as for military use. This always been an endeavour of the Indian government to develop indigenous defence equipment production capability. India has always insisted on putting a technology transfer precondition for most of the defence platforms purchased in the past . In the past , India has ensured technology transfer for Bofors howitzers purchased from Sweden , Germen HDW submarines , Su30 MKI from Russia and Scorpean Submarines being manufactured by mazgaon dock with technical collaboration with France. The technology transfer is important from the Indian point of view because in the past ,India has faced problems during sanctions which adversely affect the operational capabilities of Indian armed forces . The technology transfer ensures the uninterrupted supply of spare parts and the regular maintenance necessary to keep these weapon systems operational. The weapon system purchased with technology transfer always cost more as compared to buying from OEM country but it pays in the long run. Despite being costly , India has always opted for purchase with the technology transfer provision. Chinook 47F Heavy Lift Helicopter. Naval Multirole MH-60 Romeo Helicopter. Both India and the US are moving towards building a strategic partnership based on mutual trust and shared values . India US relations are going to play a significant role in twenty-first century . Russia has always been an invisible part of India-US relations and it will remain so . It is also going to be a challenge for India to strike a balance between US and Russia . The Chinese imperialistic ambitions , expansionist policies and complete disregard for international laws will trigger many conflicts in future . India and US are natural partners and great democracies . US needs to be realistic in its expectations while dealing with India . It is not in India’s best interest to downgrade relations with Russia for obvious reasons. Both India and the US need to focus on important strategic objectives and take the defence cooperation between the two countries to the next level . Do let me know what you think about India US defence relations.